1 1/8" Square Tube Boot Glide for Stack Chairs. For Use on carpeted surfaces. 1" Square Tube Boot Glide for Stack Chairs. 1-1/8" Square Tube Glide for Non-Stack Chairs. For use on KL and KL-S10 Series Stackable chairs that were originally equipped with this style of glide. Double Clip Glide commonly used on Barstools. Nail Glide for Wood Legs. For Barstool and Gaming Stool bases that were originally equipped with Mega Glides. Not for use on Barstool or Gaming Stool bases that were equipped with standard double-clip Steel Glides or Super Glides. Suitable for use on both carpeted & non-carpeted floors. For Barstool and Gaming Stool bases that were originally equipped with Mega Glides-Type II (screw fastener). For Barstool and Gaming Stool bases that were originally equipped with Super Glides. Not for use on Barstool or Gaming Stool bases that were equipped with standard double-clip Steel Glides. Polycarbonate molded glide with steel core reinforcement. 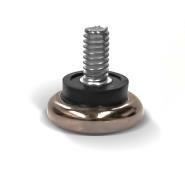 Nylon Cap for threaded glide, commonly used on table bases. Converts carpet glide for use on a non-carpeted surface. Nylon Cap for stack chairs, armchairs, barstools and wood seating (with 1.25" Diam. Glides). Converts carpet glide for use on non-carpeted surface.